This is the sixteenth in a series of blog posts about recovering from the Gulf oil spill and from oil dependency overall. The first introduces the series. Yesterday my dear friend Jill Nussinow (a wonderful cook, writer, and vegetarian nutrition expert, aka The Veggie Queen) sent me a great link. It seems that Lynne McTaggart, journalist and author of top-selling books The Field and The Intention Experiment, has also blogged lately about the Gulf oil disaster and the importance of cutting our use of petroleum. In her post of July 2nd, she unveiled lyrics to a new song fashioned after Paul Simon's "50 Ways to Leave Your Lover." And set us all free." I love this! 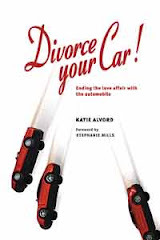 I'm not sure I could find a better lyrical representation of what Divorce Your Car! is all about, even down to specific sections of the book: "Just take the train back, Jack" – see pp. 167-169; "Hop on the bus, Gus" – see pp. 169-170; "Or ride your bike like the Dutch" -- see Chapter 12; "Just turn off the key, Lee, and set us all free" – the whole book, really, and especially Part 3. "Hop on the bus, Gus -- Or ride your bike like the Dutch"
In her post, McTaggart also lists ways we can "leave" crude oil. She suggests, for instance, "Whenever you go to use your car, think first: do I really need to drive?" This is a great question, and another topic touched on in Divorce Your Car! It came up in Chapter 17, which suggests developing a transportation menu – a term I first heard from Phil Smith, at that time the bicycle and pedestrian coordinator in Missoula, Montana. A transportation menu is essentially a list of all the ways you might get from point A to point B. A simple thing, but useful because we need reminders of how many petroleum-free or car-free ways we have to get around. Just making such a list can help us snap out of the "married-to-the-car" mindset, the idea that any time you take a trip it means getting into a car. Can you bike? Walk? Take transit? Share a ride? Access what you need by phone or Internet? Kayak to work like commuters in Vancouver, Seattle, San Francisco and probably other locales? Maybe use inline skates? 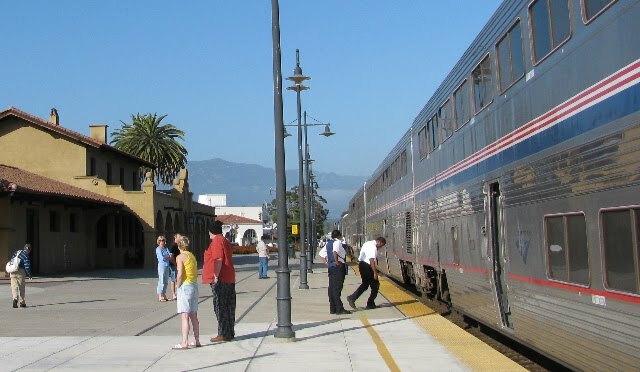 For long-distance travel, take Amtrak? These options can all go on the list. "Just take the train back, Jack"
Do I really need to take this trip? This question is made more necessary because driving can be a little too habitual. One man who wanted to break his driving habit decided to tape a note to himself on his driver's side door: "Do you really need to take this trip?" Dianne Patrick of Marquette, Michigan, has done something similar with her annual New Year's resolution to drive less. "Every day I get up and ask myself if I have to use the car, and if the answer is no, it stays in the garage," she says. If you ask: "Is this trip necessary?" and the answer is no, great! You don't have to go anywhere. If the answer is yes, move on to the next question. What changes would allow me to take this trip without using a car? Some of these changes might be collective, in the realm of advocacy and policy changes. Better land use, safer and slower streets, more support for transit, carfree city centers, fewer subsidies for highways and oil: these can all help us win a collective divorce and move beyond the problems of auto/oil addiction. But you might also be able to respond to this question with individual changes – location and lifestyle changes that you can make on your own. The book goes on to talk about moving to locations that support carfree living, as well as simplifying and slowing down to drive less and consume less oil. Add this to Lynne McTaggart's list, and you have many more than 50 ways to leave behind crude oil and our whole dysfunctional marriage to cars and oil. Seeing the number of writers and thinkers now chiming in on this theme gives me hope we are nearing a tipping point. These ideas may well be infusing the fields McTaggart writes about in her books, swelling our collective intent to truly change. My hope is that as more of us embrace the simple but beneficial ways of living better with less petroleum, they will gain power, leading us to recover from oil addiction and heal our way of life. I used to live in Tokyo and one of the greatest pleasures I had was that I probably only drove about twice a month. Every time I went out was on my bike and public transport. Of course, it makes all the difference when the public transport is excellent. I love my new rural life, but one thing I do miss about an urban area is mass transit and/or being able to walk to basic services. We are just trying to do better at consolidating trips to town and planning (plus coordinating with neighbors when possible) to keep the number of driving trips to a minimum. It is not easy when you are several miles from the nearest town with a grocery or hardware store (as you know only too well, Katie). Nicola, thanks for your comment! I do think there's much desire for better public transport in the U.S. I hear many good stories coming from Japan about their systems. Another friend recently traveled there and was very impressed with the state-of-the-art electric bicycles now used by many Japanese. Laura, yes, I do know what you mean! 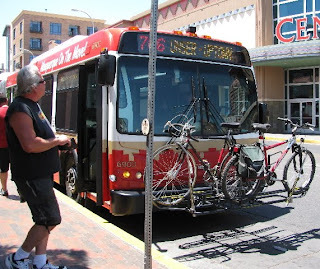 The first time I went car-free, I was living in a rural area, but at least a bus stopped (occasionally) three miles from my house, and there was no snow! Long winters add another layer of challenge to rural travel. Consolidating trips and coordinating with neighbors are both great options -- I've made some wonderful friendships in the process of sharing rides.